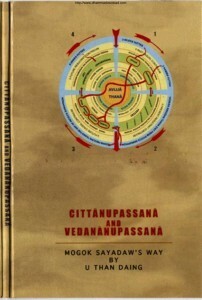 Cittanupassana and Vedananupassana with the subtitle Mogok Sayadaw‘s Way is a compilation of detailed instructions on the two meditation forms Meditation of Feeling (Vedanannupassana) and Meditation on Mind “Cittanupassana” as taught by Mogok Sayadaw. Dear brothers. I could not download the book Cittanupassana and Vedananupassana. I would like to receive your help in order to receive it or download it. Thank you! Click on its cover page of the e-book and it will start downloading.